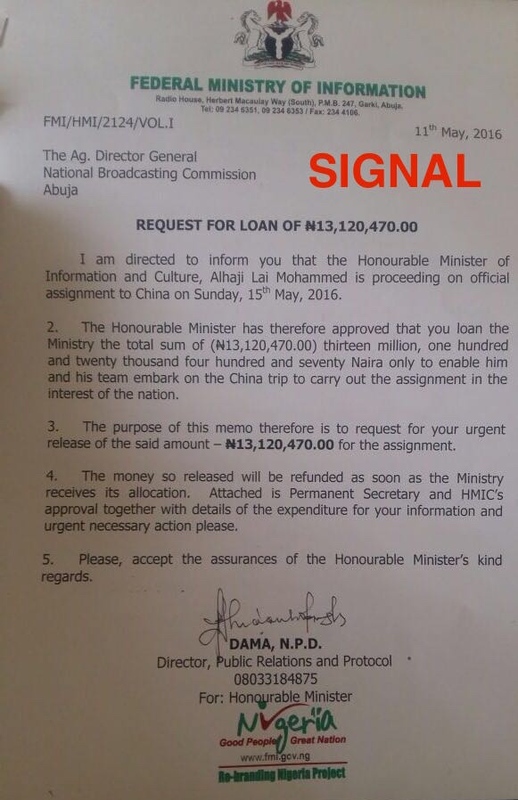 Minister of Information, Culture and National Orientation, Alhaji Lai Mohammed has written the National Broadcasting Commission demanding a ‘loan’ of N13, 120, 470 (Thirteen Million, One Hundred and Twenty Thousand Naira only) as ‘logistics’ for him and his team to travel to China on assignment they have termed is in the interest of the nation, SIGNAL can report. The memo, which was exclusively obtained on Thursday by SIGNAL, says the so called loan will be repaid as soon as the ministry receives its allocation, and attached approvals from the Permanent Secretary and the Honourable Minister. Investigations by SIGNAL however revealed that the demand is illegal and goes directly against civil service procurement and protocol rules. Apart from disregarding and exceeding the approval limit of the acting Director General which the Honourable Minister is enabling, the vague purpose of the trip is not under the purview of the National Broadcasting Commission (NBC). Also, the NBC is not a bank or official lender. The development raises concerns about the illegal use of taxpayers’ money as fodder for lending transactions between Ministries, Departments and Agencies (MDAs). 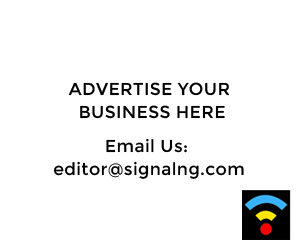 Civil service sources told SIGNAL on Thursday it is criminal to pledge government credit, expending more than N13, 000, 000 of the budget allocated to the Ministry of Information even before it has been released. The Minister’s request for N13 million unveils a can of worms under a government that claims legitimacy and credibility from its perceived tough anti-corruption stance. More so, it begs the question about how many other MDAs under the Ministry the Honourable Minister may be borrowing money from, how many others this brazen act of corruption may have encouraged to break the law and flout procurement and civil service regulations. NBC sources who did not want to be named told SIGNAL there was no plan to pay back the N13 million loan by the Minister, as by tradition, Ministers who are bold enough to make such demands have no intentions of paying back. “Apart from the fact that this money is illegal, it has entered voice mail. From experience, there is no way he is paying the money back. Ministers who make these kind of demands know what they are doing beacuse they have inside collaborators who tell them where the money is and how to pilfer it. He won’t pay back and the agency won’t have the courage to even ask him to repay. It’s more or less a bribe. It is sad and very insensitive especially when you consider the fact that auxiliary staff of the NBC have not been paid, the NBC Zonal offices have been without imprest for months, and zonal offices are without funds”, an NBC source told SIGNAL. Another NBC source described the loan as outright stealing and corruption. “It doesn’t make sense at all what the Minister has done. It is outright stealing and corruption. Why is the NBC now the cash cow for the Ministry of Information? Is it because of the N34 billion Emeka Mba and his team raised from licensing spectrum to MTN? What kind of trip to China requires a whole N13 million? I thought the president and some Ministers just returned from China? If the Minister feels strongly about this trip, why did he not write to the President to source the money? This is against civil service rules”, the source who pleaded anonymity said. Efforts to reach the Minister for comments proved abortive at the time of filing this report. It will be recalled that Nigeria has made headlines within the past 48 hours after UK Prime Minister David Cameron described the country as fantastically corrupt, followed by yesterday’s admittance by President Buhari that Cameron was correct.